The ATS Acoustics Studio Stacker™ is a portable gobo panel, and a portable bass trap in one. 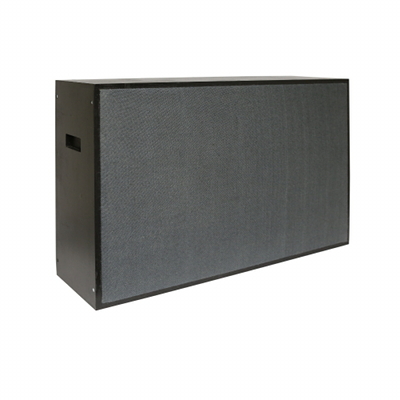 Delivers exceptional sound control by absorbing stray sound and excessive bass waves. Eliminates sound distortions during recording and live performing, and reduces sound spillage between instruments. Portable and travels easily to all of your recording and performing gigs. An affordable go-between addition to your studio. Available in natural, unfinished birch wood, or painted black. If desired, you may apply your favorite paint, stain, or varnish to the unfinished version. Front and back panels are easily removable (six screws each) to facilitate finishing. Studio Stacker™ dimensions 24" x 36" x 10". Core material is a mixture of Roxul AFB and Rockboard 60. Available in both our original and microsuede fabrics, which give a wide range of colors and textures to match your style. Manufactured with furniture quality multi-ply white birch. Removable rubber feet to reduce wear and tear. Portable and easy to transport (40 lb weight). Ships fully assembled (except for 4 rubber feet). Currently ships within: 4-6 business days. Select your desired finish for the wood surfaces. You can choose the same color for both sides of your Studio Stacker or mix and match two different colors to suit your style. Click here for larger color images or for details regarding Customer-Supplied fabric. Please choose a fabric for side B of your Studio Stacker. You can pick the same color you chose for side A or something completely different. You decide! Click here for larger color images or for details regarding Customer-Supplied fabric. Custom sizes? Your choice of fabric? Special finishes? You name it! Just give us a call toll-free at 1-866-787-7881. "Thanks so much for all your help....And my wife was freaked (happy) that I put her painting on them!..."